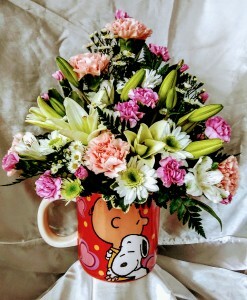 Peanuts Lots of Love in Bradenton, FL - TROPICAL INTERIORS FLORIST INC. Perfect OVER-SIZED mug for the Peanuts Fan in your life! 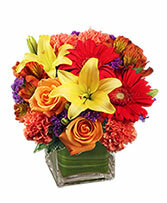 Filled with a valentine mix of long lasting flowers. As Snoopy and Charlie Brown give each other a hug on the front, the message for Lots of Love is on the back!